DEATH has come for the humorist. Sir Terry Pratchett (b.1948) died on March 12 surrounded by his family. Pratchett had been suffering from Alzheimer’s for several years. Pratchett’s first novel was The Carpet People published in 1971 and was followed by The Dark Side of the Sun in 1976 and Strata in 1981. Moving the flat earth from the science fiction novel Strata to a fantasy setting, he published the first Discworld novel, The Colour of Magic in 1983. While the Discworld books were originally intended as a satirical look at the tropes of fantasy, Pratchett quickly used them to examine modern culture and technology, publishing scores of books in the series as well as books related to them. Many of the books were turned into plays or television shows as well. The Discworld novels have also inspired their own conventions. On occasion, Pratchett collaborated with other authors, including Neil Gaiman for Good Omens, Jack Cohen & Ian Stewart for the Science of Discworld books, Jacqueline Simpson for The Folklore of Discworld, and Stephen Baxter for the Long Earth trilogy. Pratchett’s recent works have been written with Pratchett dictating them to an assistant as Alzheimers impaired his ability to type. 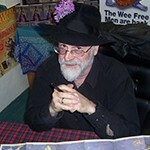 In addition to being knighted as a Knight Bachelor by Queen Elizabeth, Pratchett has received the World Fantasy Lifetime Achievement Award, the Karl Edward Wagner Award for Special Achievement, the Forry Award, and the Skylark Award. 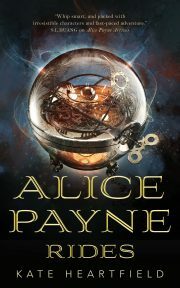 His novel I Shall Wear Midnight won the Andre Norton Award and the Discworld novel Pyramids won the BSFA Award. Pratchett was a Guest of Honor at Noreason IV, the 2004 Worldcon. My Brother In Law introduced me to Terry Pratchett by giving me a copy of “Going Postal” when it first came out. I don’t think he was aware of Sir Terry, but picked it up on a whim to give me for Xmas. For that gift I will be forever grateful. I’ve spent the last 11 years reading every disc world book I could lay hands on, in addition to some of the other series. In my career I’ve worked for two English men, so I get quite a bit of the humor that many Americans tend to miss. However there’s still quite a bit that goes over my head. Pratchett was one of my top three favorite authors, along with Stephen King, and Ray Bradbury.